Last week, we discussed in depth how you can avoid mouse elbow through improved ergonomics, proper mousing technique and stretching. Mouse elbow is one of those injuries that if you have it, you know it. It begins with an ache, then a distinct pain, and if left untreated, can prevent you from working for weeks or even months at a time. Most injuries related to ergonomics tend to fall into this category. The affects are acute, obvious and treatable. Today, however, I am going to talk about a different class of ergonomic prevention: eye strain. Eye strain can be particularly insidious because its effects are not always obvious. Whereas mouse elbow is (obviously) felt in the elbow, eye strain can manifest in the form of headaches, neck and head pain or even general sleepiness. Granted, there are often more direct symptoms as well, such as dry eyes, itchy eyes or blurry vision. However, deterioration in eye sight can be so slow as to become unnoticeable day to day. Over time, however, the effects of poor habits with regard to your eyes can add up. Here are some tips to minimize eye strain at work. 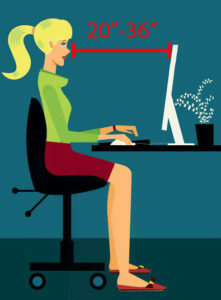 According to OSHA, your monitor should be positioned at least 20 inches away from your face. There are some rather intricate physics principles for why this is the case, but the short version is that, in general, your eye needs to work harder in order to bring text into focus that is closer. However, as text moves further away, it becomes more difficult to disambiguate characters. Therefore, you will likely find that the most comfortable range is somewhere between 20 and 36 inches from your face. Every now and then, take a break from staring at your monitor. Stare off into the distance or allow your eyes to relax out of focus. Doing so will not only give your eyes a chance to break out of the 20-36 inch focus range discussed above, but it may actually give you a chance to see a difficult problem in a different light (both literally and figuratively). When focusing on a computer monitor, particularly when you are “in the zone” coding or working on a hard problem, it is common for your reflexes to slow down. You will often blink less and your eyes will produce fewer tears. This can lead to dry, irritated eyes. Teach yourself to blink more often and it may reduce eye irritation. Proper environmental lighting is incredibly important in reducing eye strain at a computer monitor. There are two types of light to take into account. First, try to avoid sitting near bright specular lights. These are the sorts of lights that produce “hot spots” of glare on your monitor. If possible, try to work under lights which have a diffuser, the textured and semi-transparent panel of plastic or glass that makes it so that you can’t see the actual bulb. Second, the ambient light level should be set so that it does not overpower the contrast settings of your monitor. If the ambient light is such that you cannot see text on your monitor without maxing out the brightness setting, consider reducing the level of ambient light with window shades. F.lux is a fantastic program that will automatically adjust your contrast settings throughout the day. In addition, consider adjusting the theme colors of your text editor or IDE. In general, dark text on a white background is considered the best when displaying paragraphs of writing. However, light text on a dark background can work as well, so long as the contrast of colors is not overpowering. XCode, for instance, ships with a number of different contrast settings, so explore a bit and see what works. Consider using different themes settings to minimize eye strain. As a rule of thumb, try to use a font size that is as least 3 times as big as the smallest font that you can see. Among other things, using a larger font will allow you to more easily discern characters and those pesky brackets that are preventing your code from compiling. This one goes without saying, but many people tend to ignore it for some reason. Go to the optometrist and make sure your prescription is up to date. If you need glasses, or your prescription is out of date, your eyes will be doing overtime trying to bring things into focus that they cannot possibly bring into focus. I am ashamed to say that I put this off for several years until the pain and suffering go so bad that I finally caved and got a pair of glasses. Now, I no longer have headaches from working at a computer and my glasses look pretty cool to boot! Hopefully you found this list helpful. Remember, your eyes are your window to the world, so treat them well! If you have any other tips and tricks for how to reduce eye strain at work, let me know in the comments below!